There Is no experience like CES with the largest global gathering of innovation and the connected future of technology with 4,000 exhibiting companies—600 of which are new. There are many trade shows in every industry, but the one that covers just about all industries is the Consumer Electronics Show, which will be held in Las Vegas from January 9 – 12th. The products exhibited at this show are not just for the consumer. A company can find future trends that will affect that company’s industry. Whether you are in agriculture, robotics, alternative energy or manufacturing, you will see products that will impact what will be manufactured for the consumer. As a consumer, this show offers a lot of technology for the home owner. Technology from these industries carry over to the home owner as well. Technologies, such as energy storage, electric vehicles, drones, smart irrigation, robotic lawnmowers, 3D printers, personal robots and artificial intelligence transcend from the business world to the home. The residential energy storage market is experiencing a revolution this year. In 2017, it is the first year that grid tied residential battery storage systems outnumber off grid and grid independent systems across the United States. Traditional grid tied solar systems only operate when utility power is available. 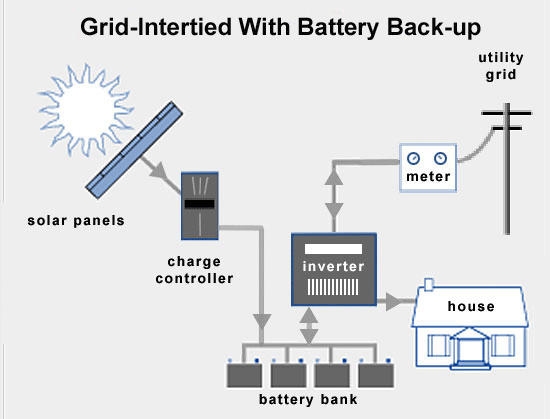 Without energy storage, a grid tied PV solar system shuts down during a power outage. The addition of a residential battery storage system can provide seamless, uninterrupted power for a household during an outage while still offsetting the power bill. Protect your home from the next power outage and keep your lights on, phones charged, and no defrosted food. Companies to check out at the show are Watts Battery Limited (Sands, Hall G – 52901), Sharpell Technologies (Sands, Hall G – 51083), Highpower International Inc. (LVCC South Hall 4, 36153). Smart Home owners love their apps, whether controlling lighting and music or managing energy, heating and air conditioning in their homes from anywhere. Now, solar monitoring can be added to the smart phone apps, allowing for the tracking of how much money that is being saved every month. Microinverters send a quick message to share the solar energy production information via existing powerlines, as well as sending the data to a software program. From there, it is easy for a home owner to keep an eye on the system with an app to make sure everything is working correctly and give you all the data on how much energy you are producing. Climax (Sands Hall A-D 41952) is a smart home security solution provider integrating wireless security, senior care, home automation, energy management, emergency service, and visual monitoring into innovative all-in-one solutions. Murata Electronics (LVCC South Hall 2, MP-26151) designs, manufactures & sells ceramic based passive components, wireless module solutions & power electronics. Murata's innovations are used in consumer devices, healthcare equipment, automotive applications, energy management systems, data centers, lighting, computers/networking & more. Your next car might just be an electric vehicle, as more new models are being made available next year. A minimum of six new models are expected, all promising ranges of 200 miles or more—which until a few months ago had been the exclusive province of Tesla Motors. Among them includes the first production long-range battery electric cars from Audi, Jaguar, and Mercedes-Benz. 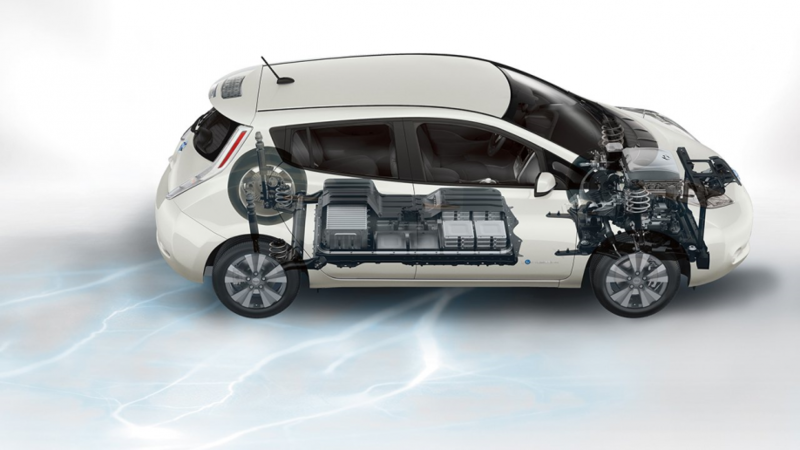 Along with the Chevrolet Bolt EV and the Tesla Model 3, the 2018 Nissan Leaf is one of three affordable electric cars with 200 miles of range or more that's expected to go into production. DazeTechnology (Sands Hall G – 51926) develops, manufactures and markets innovative high-tech mechatronic systems, in particular with application in the automotive industry. Their main project is DazePlug, an autonomous charging system for electric vehicles. NAVYA (LVCC North Plaza NP9) develops driverless, automated electric vehicles independent of all infrastructure. Of course, the fun part of the show are the drones. Drones have moved from kid’s toys to serious applications, such as wind turbine or solar array inspections. Wind turbine inspection is usually done visually from the ground with binoculars, camera telephoto lenses or a relatively complicated rope and platform access. Now, unmanned aerial vehicles, otherwise known as drones have streamlined the procedure. They not only inspect the blades but also the tower and nacelle, resulting in an easy, economic and safe inspection with reduced downtime. A drone can also easily pick out a broken or malfunctioning solar panel. A defective panel creates a distinctive heat signal as it fails. Before drones, a homeowner would have to climb a ladder to the roof and manually check each panel, but now a drone outfitted with a thermal sensor can easily find the failed panel. Airborne Concept SAS (Sands Hall G-50421) designs and sells drones, while offering end-to-end solutions, ranging from flight training through to the design and production of a tailored drone. World Tech Toys (LVCC South Hall 2-26413) manufactures remote control drones, helicopters, cars and trucks. C-Fly Intelligent Technology (LVCC South Hall 2-27424) is a manufacturer for GPS drones, first person view (FPV) racing drones, aerial photography drones and FPV equipment. While solar and wind take care of the inside of your home, there are robotic lawn mowers and smart irrigation systems to make the outside of the home beautiful. 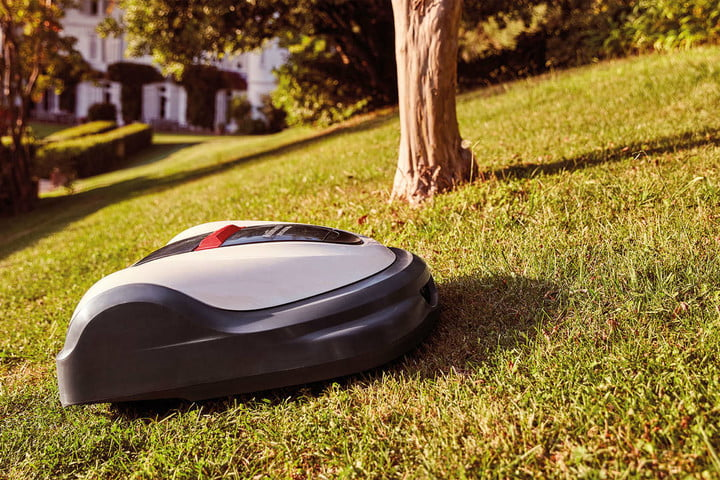 Unlike traditional lawn mowers, mowing a lawn in the hot sun is not a problem for robotic lawn mowers. With rain sensors included in most, the units will return to the charging dock to safely wait for humidity levels to drop before they return to their routine. With the right features and options, a robotic mower is a sensible option for small and large lawn upkeep. Honda (LVCC North Hall 7723) creates intelligent technologies that enrich lives and make the world more fun to move around in—on the road, on the water, in the air and beyond. 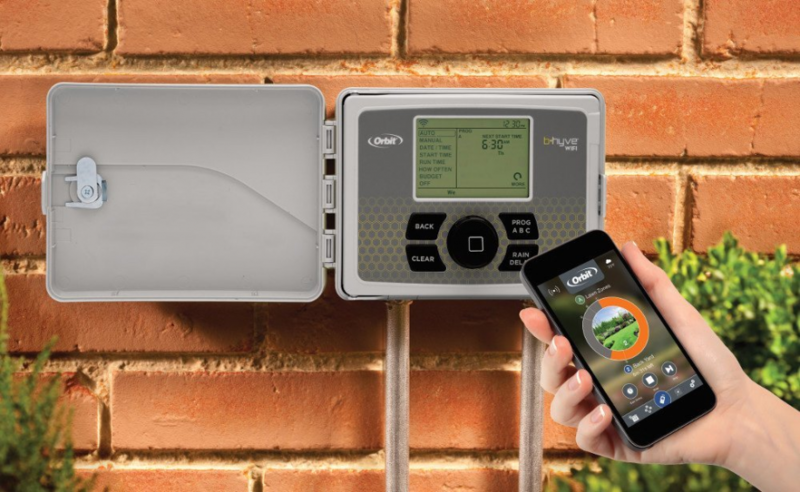 Smart sprinkler systems don't just provide better managed and more accurate irrigation of the lawn and outdoor plants, they'll help save money on water bills. They are designed with advanced scheduling capabilities and WiFi connectivity. Smart sprinklers and irrigation controllers can simplify home lawn and garden care by reducing water consumption. Instead of fixed timers, these systems draw on data from sensors, weather forecasts and plant-care databases to determine watering needs and deliver just enough moisture at just the right time. The Orbit (Sands Hall A-D 40137) name has been associated with innovative and high-quality smart irrigation products. They carry those traits as they expand to become a world leader in the industry. They empower and inspire customers to improve their homes by providing innovative, easy-to-use irrigation products. If you want to learn about the latest in robotic technology visit the booths of Omron Global (Robotics Marketplace, LVCC South Hall 2-25541, LVCC South Hall MP25356 and MP25765). Omron's primary business is the manufacture and sale of automation components, equipment and systems, but it is generally known for medical equipment. They are involved in industrial automation, such as sensors, switches, safety components, relays, control components, electric power monitoring equipment, power supplies and PLCs. They manufacture electronic components, such as relays, switches, connectors, micro sensing devices, MEMS sensors, image sensing technologies; as well as automotive electronics, such as automotive radio components, driver monitor sensors, electric power steering, integrated control units, switch and control components. They make social systems, such as access control systems, road management systems, traffic signal controllers, security/surveillance cameras, automated ticket gates, ticket vending machines, fare adjustment machines; and they are well known in the medical field with their blood pressure monitors, digital thermometers, body composition monitors, pedometers, nebulizers, non-invasive vascular monitors, portable ECGs, and patient monitors. Robots are an intriguing technology that can straddle both the physical and social world of people. Inspired by animal and human behavior, the goal is to build personal robots with a living presence, and to gain a better understanding of how humans will interact with this new kind of technology. People will physically interact with personal robots, communicate with them, understand them, and teach them, all in familiar human terms. Ultimately, such robots will possess the social savvy, physical adeptness, and everyday common sense to partake in people's daily lives in useful and rewarding ways. The Kuri robot by Mayfield Robotics is mobile and comes equipped with WiFi, Bluetooth, a 1080p camera, and facial recognition. It has telepresence capabilities to enable you to talk through the robot to others that are at home. It can navigate your home avoiding obstacles and pets and could double as a home surveillance system as it hears and sees what’s going on in your home. Kuri makes beeping sounds that will remind you of R2D2 from Star Wars. Kuri will take daily photos and saves the content to an app on your phone, where you can view, edit and share the content. Ubtech Robotics Corp. (LVCC South Hall 2-26021) is a leading AI and Humanoid Robotics Company. The company develops, manufactures and evangelizes robotic technology around the world. UBTECH's humanoid and intelligent robots propelled it to the top as a leader within the artificial intelligence and service robot domain. Artificial intelligence is coming to smart homes. Nexia (Sands Hall A-D 41717), a brand of Ingersoll Rand, created a wise and intelligent home where everything works well together as a system. Their AI system anticipates home owners’ needs, and gives them a sense of security. This is accomplished from a single app without bouncing in and out of separate apps to turn off lights, lock doors or set the thermostat. Nexia believes that’s what a smart home should deliver. One of the most fun technologies is the 3D printer, originally designed for making toys then prototypes, and then mass manufacturing. The price is reasonable and a 3D printer can make many products easily for consumers. Sometimes, we just want to print something just for fun, something which won’t take longer than an hour. Here are some items that are quick to make: one handed bottle opener, whistle, comb, simple toothpaste squeezer, book ends, earbud case, wallet, gearbox keychain, sink fountain, and card carousel. 3D Printer Manufacturer, Airwolf 3D (LVCC North Hall 8908) is recognized for promoting 3D printing technology and widely known for industry leading material capabilities, build volume, and durability. They feature 40 plus materials, including polycarbonate, bridge nylon, and other engineering grade polymers. Formlabs (LVCC North Hall 7908) is helping to usher in the third wave of 3D printing with the Form 2, the most advanced desktop 3D printer ever made. The Form 2 incorporates a host of new features to deliver the highest level of reliability and quality. Markforged (LVCC North Hall 8100) brings high strength 3D printing to everyday engineering. Offering the world’s only 3D printer capable of automatically reinforcing parts to aluminum levels of performance, Markforged enables businesses to create parts with structural strength from their desktop with ease. Raise3D (LVCC North Hall 8510) products are used in a wide variety of fields including architecture, medical, dental, product design, manufacturing, education, costuming, model making, props, and more. They have offices worldwide and is on track to become one of the fastest growing 3D Printing companies. Supply Chain Software is the software tools employed in executing supply chain business, handling supplier relationships and monitoring connected business processes.